Posted on 04/17/2019 by Yanis P.
Many pundits associate higher copper prices with inflation. This is the wrong metric to look at; higher copper prices are usually associated with an improving economy. Copper has traded past a key resistance point ($3.00) and it has managed to close above this important level on a monthly basis. The long term outlook for copper is now bullish and will remain so as long as it does not close below 2.80 on a monthly basis. Copper is facing resistance in the 3.20-3.25 ranges and as it is now trading in the extremely overbought ranges. 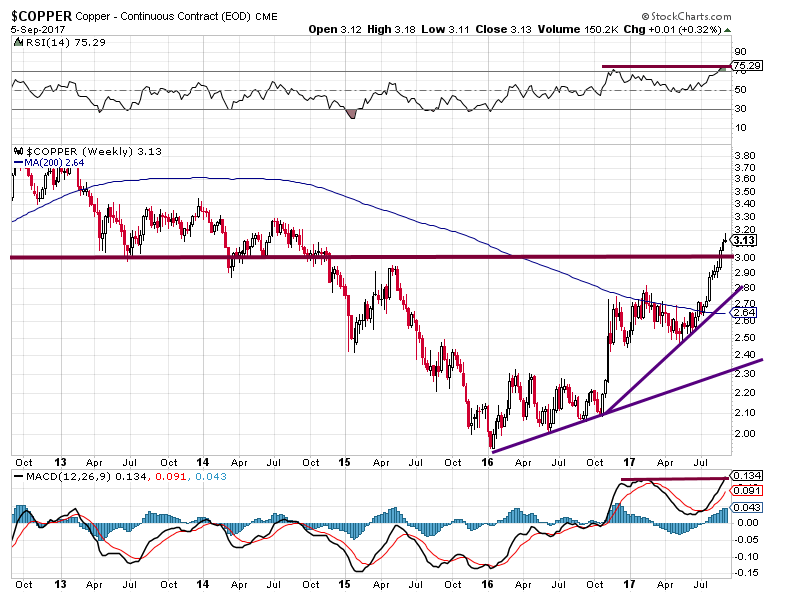 As copper is now trading in the extremely overbought ranges, it is more likely to let out some steam before trading past this zone. A healthy consolidation will provide copper with the force necessary to challenge the 3.20 ranges and trade as high as $3.80 with a possible overshoot to $4.00, provided it does not close below $2.80 on a monthly basis. Now that copper has traded past $3.00 on a monthly basis, the Fed deserves another pat on the back for they have managed to further cement the illusion that this economic recovery is real. Copper is seen as a barometer for economic growth, so pulling off a Houdini here is probably going propel a lot of former naysayers to embrace this economic recovery. 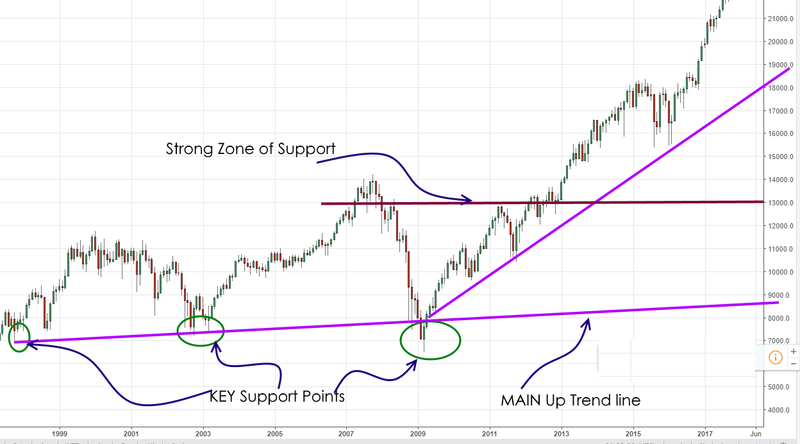 Posted on 04/16/2019 by Yanis P.
The Dow would have to drop below 9000 to break below the main uptrend line; an unlikely event in the near future. However, this does not mean it’s impossible. Every once in awhile the markets experience a monumental crash that can shave of as much as 60% of the Markets current value. In this is instance we are using weekly charts; each bar on the chart represents one week’s worth of data. Straight off the bat, you can see that back breaking corrections translate into long term buying opportunities. Remember when there is blood in the streets and the masses are in panic mode, the opportunity is knocking. The first zone comes into play at 16,000. If the Dow closes below this level on a monthly basis then there is a chance it could trade as low as 13,000. However, based on the current market sentiment, there is very little likelihood of such a scenario coming to pass. Mass Psychology is very clear when it comes to dealing with stock market crashes. Market crash on a note of Euphoria and bottom on a note of despair. 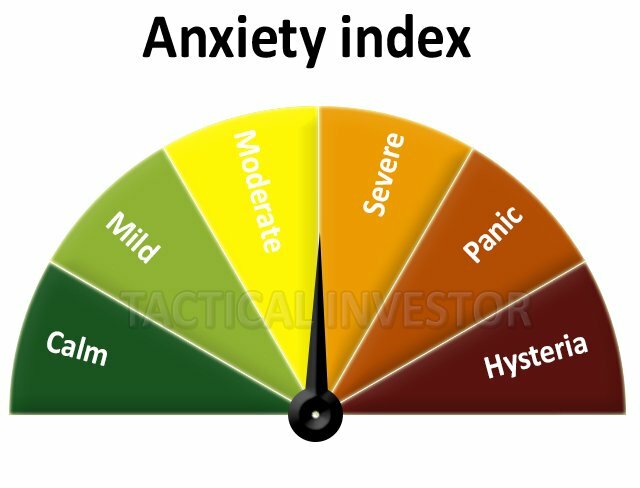 Mass psychology states that optimum time to get into the markets is when the masses are in panic mode. To trade any lower than this level, the Dow would need to close below the above ranges on a quarterly basis. If it were to do that then the main uptrend line could be tested. Note that this trend will continue to trending upwards, so in 12 months, the trend line could move from the 9000 ranges to the 10,000 plus ranges. 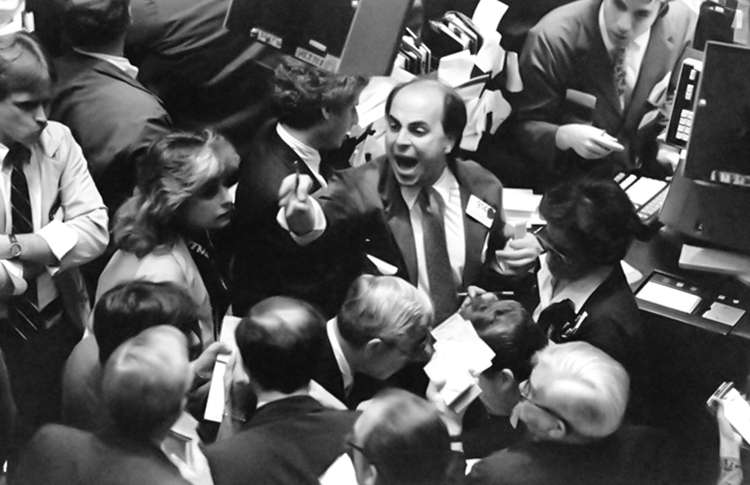 The individuals who arrive at the party late are the first ones to come out and mistake a correction for a crash.The crowd panics when it sees blood in the streets; instead of joining the crowd do something different take advantage of stock market crashes and buy as the crowd dumps quality stocks and flees for the exits. What is stunning to one, could appear ugly to another; it comes down to the angle of observance. Alter the angle and the image changes. Mass media and most experts try to alter the angle and direct you to see what they want you to see. They are in the fear “Selling Business” because fear sells, so they focus on creating a mountain out of a mole hill. 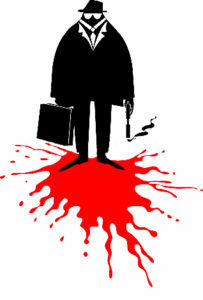 History clearly indicates that the Astute investors build very large stakes when there is blood in the streets. Moreover, they keep building these positions as long as the main driving force is fear. 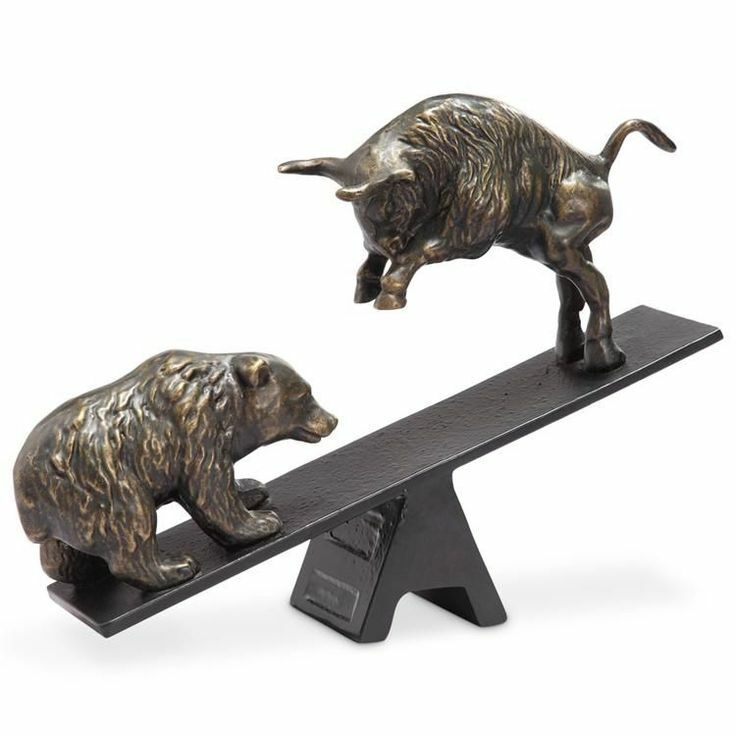 Take a look at the current Bull market; the Dow is trading at 22,000 and the masses are still nervous. It’s history in the making. The masses are always on the wrong side of the markets in the long run. The astute investor always views financial disasters through a bullish lens. Instead of panicking they take advantage of stock market crashes. Normality highly values its normal man. It educates children to lose themselves and to become absurd, and thus to be normal. Normal men have killed perhaps100, 000 of their fellow normal men in the last fifty years. 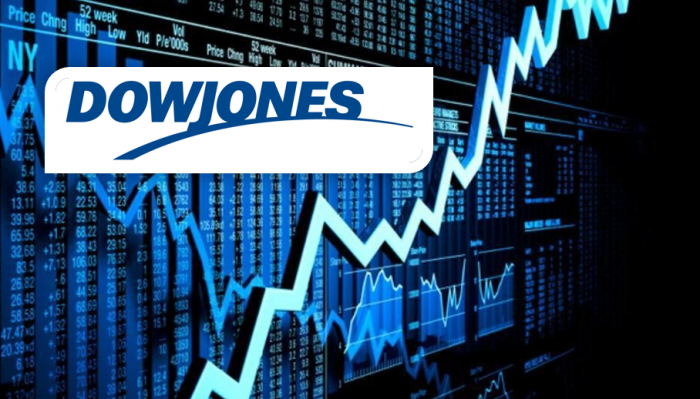 Posted on 04/13/2019 by Yanis P.
What’s next for the Dow? Posted on 04/10/2019 by Yanis P.
The data below serves as further proof that the economic recovery is nothing but an illusion. It has only benefited those who don’t really need it. The rich have become even richer, the middle class has vanished and the poor are becoming even poorer. Real incomes have been flat to down slightly for the average household in the bottom 60% since 1980 (while they have been up for the top 40%). Those in the top 40% now have on average 10 times as much wealth as those in the bottom 60%. That is up from six times as much in 1980. Only about a third of the bottom 60% saves any of its income (in cash or financial assets). Only about a third of families in the bottom 60% have retirement savings accounts—e.g., pensions, 401(k)s—which average less than $20,000. For those in the bottom 60%, premature deaths are up by about 20% since 2000. The biggest contributors to that change are an increase in deaths by drugs/poisoning (up two times since 2000) and an increase in suicides (up over 50% since 2000). The top 40% spend four times more on education than the bottom 60%. The average household income for main income earners without a college degree is half that of the average college graduate. Since 1980, divorce rates have more than doubled among middle-aged whites without college degrees, from 11% to 23%. Sentiment indicates the masses are not bullish so this market is not ready to crash. Instead of panicking make a list of stocks you would like to own and when the market’s pullback, buy these quality stocks at a huge discount. Posted on 04/09/2019 by Yanis P.
Stubbornness does have its helpful features. You always know what you’re going to be thinking tomorrow. Expert after expert is busy proclaiming that the world is about to come to grinding halt again. They never seem to let up on pushing this sewage onto the unsuspecting masses. This is a clear example of insanity in action; mouthing the same thing over and over again with the desperate hope that this time the outcome will be different. The outcome will not be different this time, at least not yet. These guys should focus on writing fiction for reality seems to elude them completely. For years we have stated (and rightly so) that until the sentiment changes, this market will continue to soar higher and higher. So are we stating that the stock market will never crash? No that is not what we are stating. The market will crash, but for the astute investor, “crash” is the wrong word to use. A strong correction is more likely as most astute investors got into this market a long time ago. It is the crowd that will eventually decide to embrace close to the top that will experience this crash that the experts have been hyping about for years. This market will experience one strong correction before it crashes, but the moment the Dow sheds 1000 points or more these experts will crawl from the rocks they were hiding under and start screaming bloody murder. To which our response is, please scream as loud as you can; for it will push the markets lower creating a better buying opportunity for us. This is exactly what we said in Aug of 2015 before Trump won and countless times before and after that. 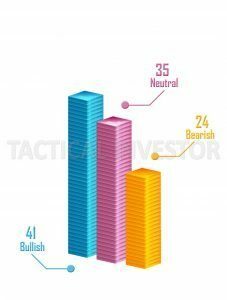 The Bullish sentiment has risen somewhat, and the crowd is not as anxious as it was at the beginning of this month or last month, but until the readings indicate this crowd is euphoric, a crash is unlikely. 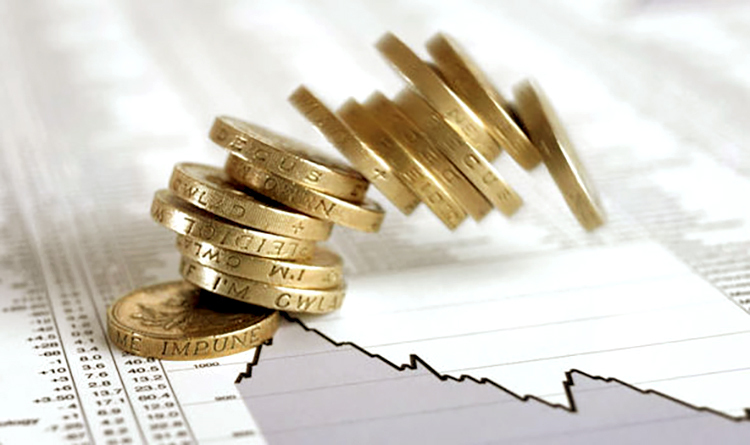 Many people state that most people don’t have money to invest in the markets. We beg to differ; look at whats going on in the Bitcoin market, now that is a market showing some signs of Euphoria; the stock market in comparison is at the lukewarm stage. The only thing that is going to crash and has been crashing since 2008 is the egos of these “know it all” experts. If any of them had even listened to themselves half of the time; they would have bankrupted themselves several times over. The fact that they are still around chiming the same rubbish is clear proof that they don’t believe a word they are putting to print and therefore neither should you. The sheer volume of these articles validates our view that the masses are from bullish and a crash is unlikely. Until the sentiment or the trend changes, all strong corrections should be viewed through a bullish lens. Posted on 04/08/2019 by Yanis P.
Gold bottomed in 2002, and it took nine years for its trade to a high of roughly $1900 (September 2011). Contrast that to Bitcoin, in less than 1/3rd of the amount of time it is showing gains of more than 11,000%. It took nine years for Gold to show gains of roughly 700% and Gold has given up a substantial portion of those gains. Gold was trading in the extremely overbought ranges, and the Gold Bug Camp could not contain their glee; they thought the sky was the limit. Instead, they found out that the Ground was a lot closer. The masses were not embracing Gold, and they refused to treat or view it as a currency. Only those from the hard money camp continued to believe that Gold was a currency, but sadly their numbers are dwindling with the passage of each day. The masses view Bitcoin as cool and secure; a feat Gold has struggled to achieve and is not likely to achieve in the foreseeable future. Whether this is true or not, hardly matters for when it comes to investing, perceptions are all that matter. Does this mean the precious metals sector is dead? India’s gold consumption is likely to drop to its lowest in eight years in 2017, hit by government moves to make bullion trading more transparent and by faltering demand from some rural areas, the World Gold Council (WGC) said on Thursday. The dollar topped in early 2017 and what did Gold do? Absolutely nothing; instead of surging to new highs it could not even trade past its July 2016 highs. The dollar, in contrast, has been going through a well deserved period of consolidation after mounting a stunning rally that started in 2011. It tested support and held, and as long as it does not close below 90 on a monthly basis, the outlook will remain bullish. Consequently, a monthly close above 94.50 will open the possibility for a test of the old highs. 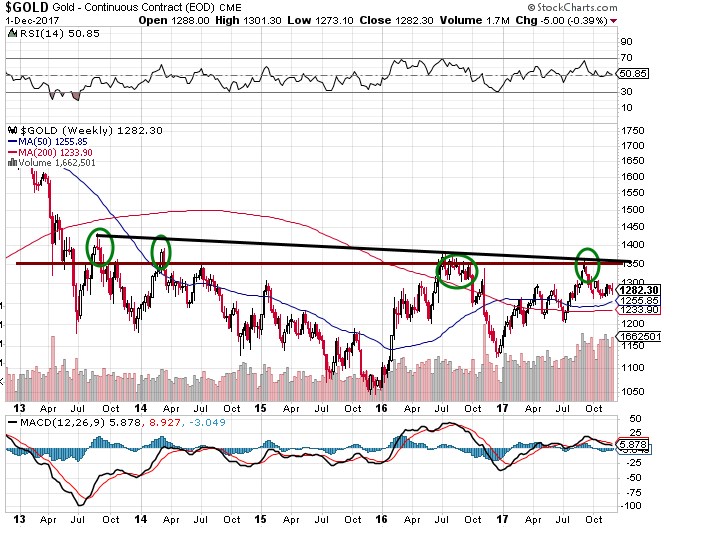 The dollar is getting ready to mount a rally, demand for Gold is declining, and Gold has been unable to trade past $1350 even in the face of a weaker dollar. Then we have the Bitcoin market, which the masses (especially millennia’s) find to be a lot more exciting and rewarding than Gold. All these factors don’t bode well for Gold. It appears that Gold is likely to test the 1000 ranges unless it decides to diverge and trend upwards in tandem with the dollar. Bitcoin, on the other hand, is now in the feeding frenzy stage, so this market is ripe for a correction. However, the upward move is still not over. After a hard correction, Bitcoin is likely to resume its upward trend. Gold will probably never experience a move akin to that of Bitcoin, but that does not mean it won’t make for a good investment one day. For now, the trend is neutral; a weekly close below $1100 will darken the outlook for Gold, but a monthly close above $1350 will indicate that Gold is ready to trend higher. Never fall in love with any investment. In the end, it’s the trend that you should pay attention to, for no sector can trend upwards forever. 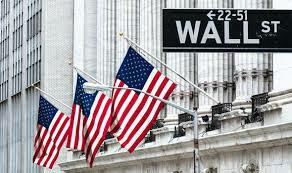 The odds of the Dow trading to 29,000 are far better than of Gold trading to $1900. Posted on 04/07/2019 by Yanis P.
The theme from the Gold bug camp for so long has been; Gold is going to soar to the moon. What many forget is that these fools have been singing this same song for decades. Instead of soaring to the moon, Gold has been licking the dust for almost 7 years. It topped off in 2011 and since then the action has all down with a few false breakouts that the misguided Gold bugs mistook for the beginning of a new bull run. We are not against Gold or the precious metals sectors; we actually favour the hard money doctrine, but the problem is that view is not shared by the majority. Mark Dice illustrated that most individuals would take a candy bar over a 10oz bar of Silver. Now many would respond by saying these people are stupid, etc. That’s not the point, the point is that most people no longer view Gold as currency; instead, they view it as some ancient relic. Is the Dollar getting ready to Rally? The bigger issue is that the Dollar appears to be putting in a base. The dollar has mounted a very strong rally since it bottomed out in 2011, so the current consolidation is to be expected. 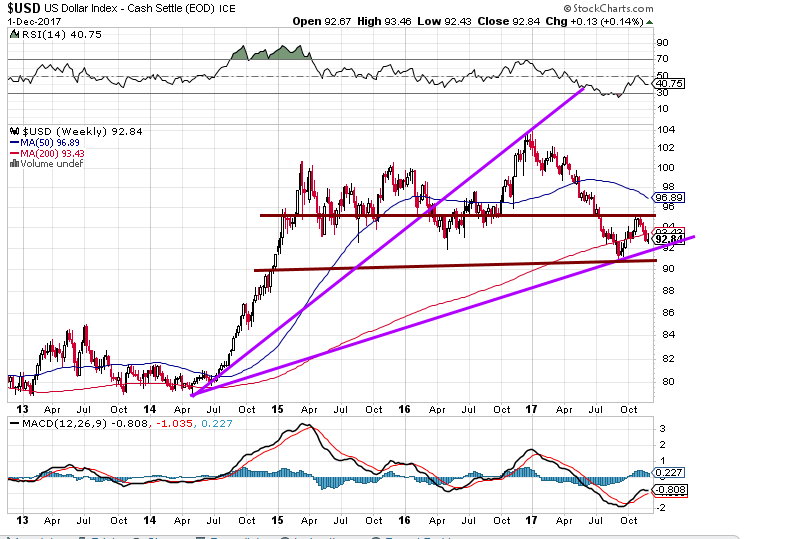 The dollar is holding firmly at 90; a zone of strong support. As long as the dollar does not close below 90 on a monthly basis the outlook will remain bullish. With the passage of the Trump’s Tax package, the outlook for the dollar and the stock market has brightened significantly pushing Gold even deeper into the shadows. If the Dollar can close above 94.50 on a monthly basis, the groundwork will be laid for a test of the old highs. The dollar topped in early 2017 and did the Gold market respond positively to this event. The reaction was muted at best. Instead of surging to new highs it could not even trade past its July 2016 highs. To make matters worse, gold put in a lower high than it did in July of 2016, even though the dollar traded below its 2016 lows. Instead of putting in a series of higher lows, Gold has been putting in a series of low highs since 2013. 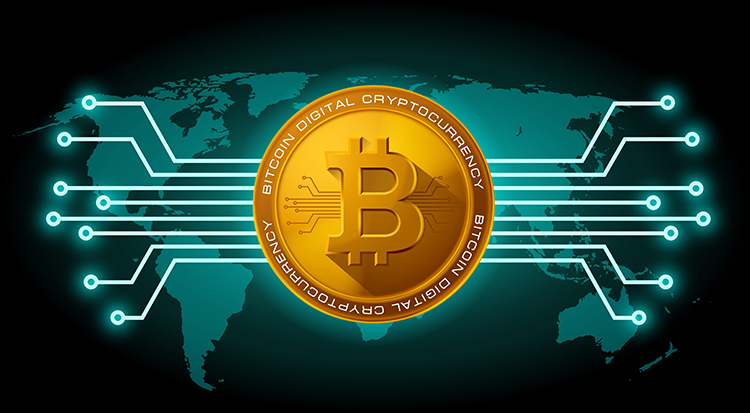 It has not managed to trade above $1350 for more than a brief period. This illustrates that demand is not robust and the market is not pricing in all the negative news. 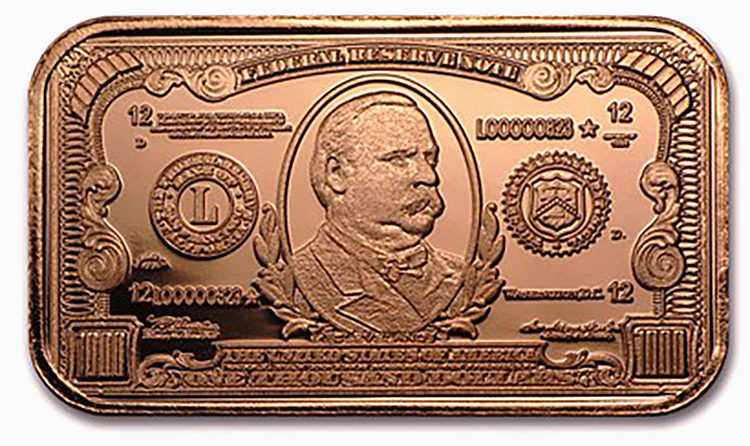 Until Gold can trade above $1350 on a monthly basis, the outlook will remain Neutral to bearish. The dollar is oversold and the pattern is still bullish. It has gone through an extensive consolidation phase and it is now trading in the oversold ranges. A monthly close above 94.50 will solidify the longer-term outlook and indicate that the dollar is ready to test and possible challenge it’s all-time highs.